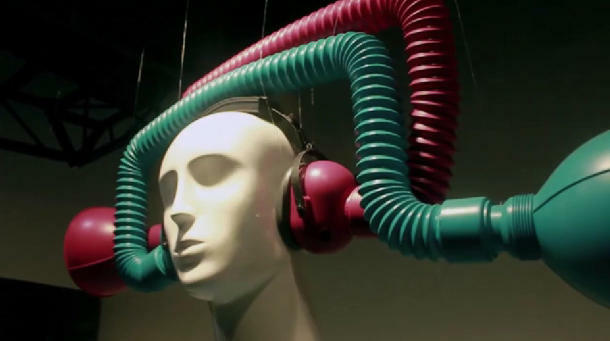 These Headphones Will Mess With Your Head | OhGizmo! The nice thing about art is that is often makes ‘why’ irrelevant. Granted, sometimes the artist will pay lip service for why he’s done this or that, but art is supposed to evoke emotions within you. Looking at the above Reverse Listening Device, we can’t help but think “WTF is that”, which we’d immediately qualify as effective art. Even briefly delving into the “why” of the thing sort of takes away from its beauty. But in the interest of sound reporting (something we’re definitely known for), the above is the creation of UK artist Dominic Wilcox, who wanted to create a display at Selfridges department store in London as part of an exhibition called the “Festival of Imagination.” It’s called “Variations On Normal”, and is simply a set of headphones that take sounds coming from the left and funnel them to your right ear, and vice versa. The sensation of wearing it is described as “very strange”. Artists are known to give enlightening descriptions. No, no, this isn’t going to be made into a real product. We’d still like to give it a listen though.